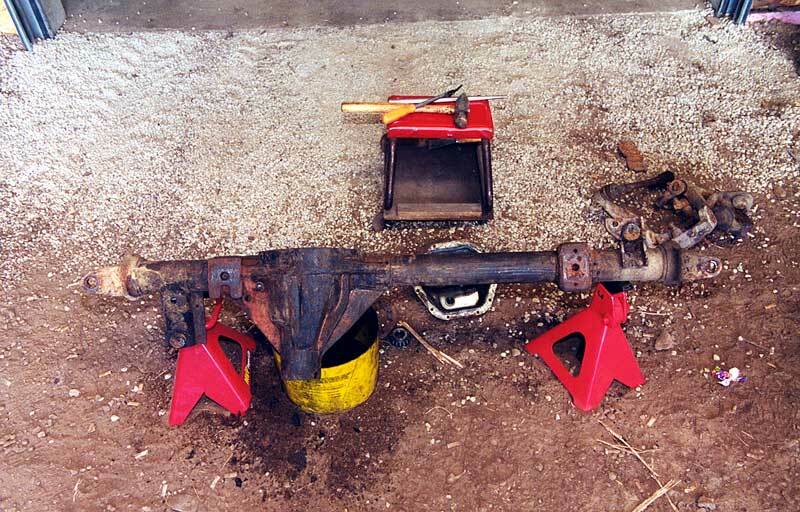 The Ford front axle housing after being removed from the donor truck. 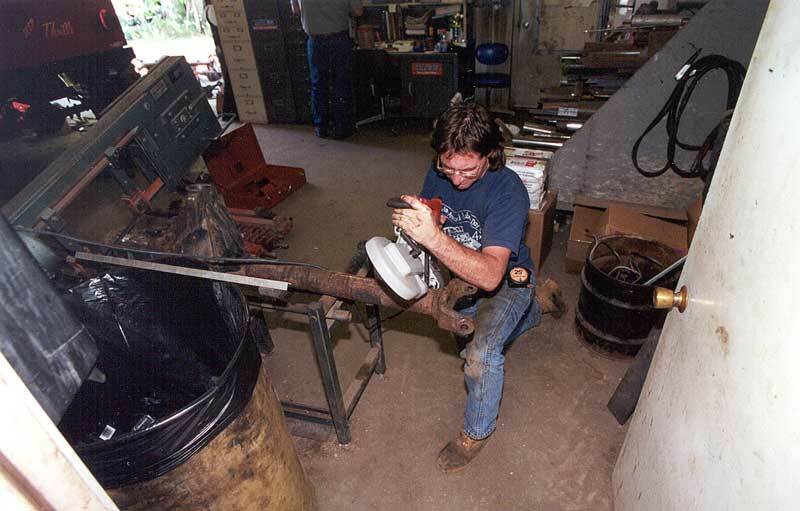 Tom Steiger uses a portable band saw to shorten the axle housing. 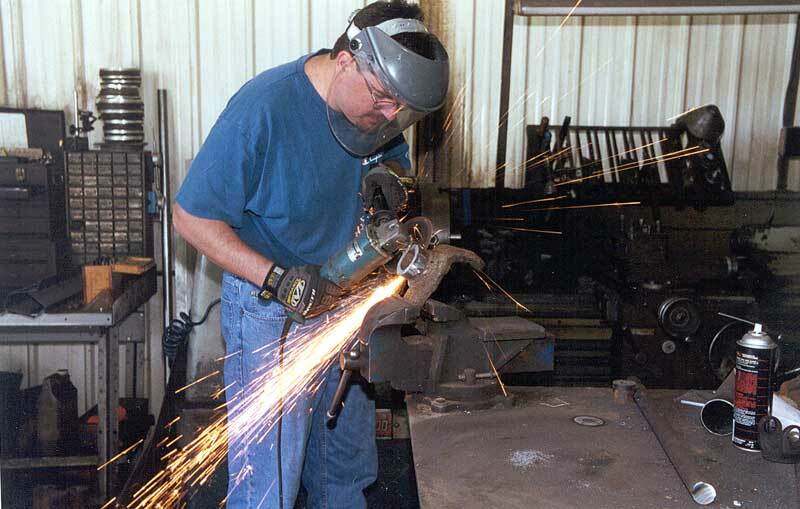 The author cutting the welds off the inner knuckles. Once the weld is cut through, the inner knuckle and axle tube can be separated. The caster angle needs to be exact. Warn 4340 alloy axle shafts ready to be assembled. Shortened axle housing ready to be installed. I have been slowly building up my Jeep Wrangler YJ into a very capable rock crawling machine. After I completed my AX-15 to 700R4 transmission swap, I decided it was time to take a closer look at my axles. I decided to start with the front Dana 30. My YJ Dana 30 had been upgraded to the point there wasn't anything left to do. It had become a stout little unit which was perfect for a part time trail vehicle. Since I was planning to put on tires larger than the 33" tires I was currently running, I thought it was time to upgrade the front axle to a Dana 44. Dana 44s came in the front of a variety of different four-wheel drive vehicles over the years. The easiest version to put into a YJ is one from a 1980 or newer Jeep Grand Wagoneer. The width on those axles is only 1" wider than the stock Dana 30 and the differential is on the driver's side. I had been planning this swap for a while and had gone as far as purchasing and stripping a 1987 Grand Wagoneer. The width was right, but I was concerned about the pinion angle since I had suspension modifications on the horizon. 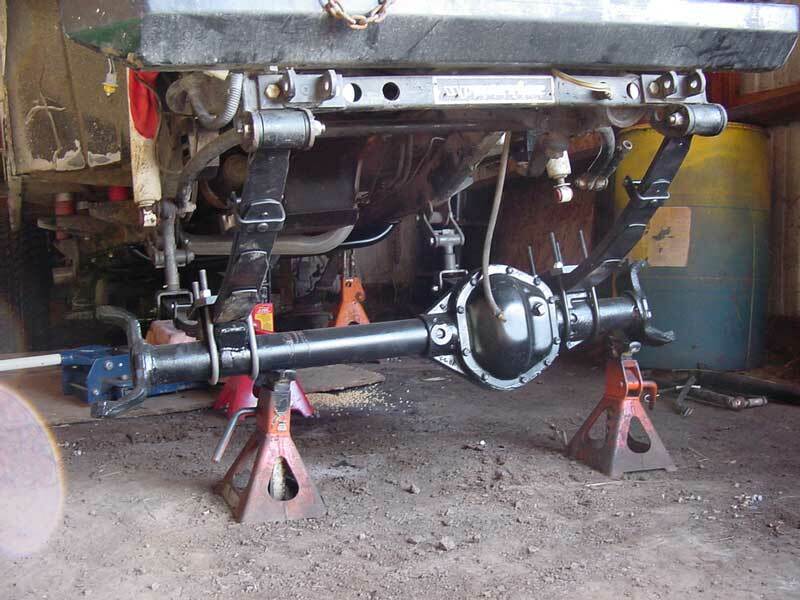 The YJ Dana 30 axle is a reverse-cut axle which has the pinion entering the housing above the center line of the axle. The couple of inches difference in pinion location make a big difference in the driveshaft angle. The other advantage of reverse-cut axles is that the spiral on the ring gear is in the opposite direction from a standard-cut ring gear. The standard-cut gears are stronger in the rear because of the direction they turn, but the front turns in the opposite direction making the reverse-cut gears stronger in the front. So now I knew I wanted a reverse-cut Dana 44 the width of a Jeep Grand Wagoneer. Finding a reverse-cut Dana 44 is much more difficult than finding a standard-cut Dana 44. The best sources are 1978-1979 Ford F-150 and F-250 trucks. Both have the differential on the driver's side like my YJ. The F-150 used a coil spring suspension in the front, while the F-250 had leaf springs mounted over the axle. The coil spring version requires quite a bit more work to get the old suspension components off, but will work. The F-250 on the other hand is a perfect donor because it has the driver's side spring pad cast into the differential housing. One of the big advantages to living in Minnesota is the highway workers love to use salt on the roads during the winter. This has left a plethora of older rusted out vehicles in the scrap yards. I found plenty of F-150s, but finding an F-250 at a reasonable price was proving to be difficult. One evening I stopped by my local 4-wheel drive emporium, 4x4 Unlimited, and mentioned to the owner that I was looking for an F-250 axle. Jim took me around the back of the shop and showed me an extended cab 1978 F-150. I looked underneath and was surprised to see it had leaf springs. I did some further research and found out the Ford used the leaf spring suspension on the extended cab versions of the F-150 due to the added weight of the cab. I quickly made a deal for the axle and the work began. Now that I had an axle, I needed to figure out how to make it fit in my YJ. What I needed to do was make the F-150 axle the same width as the Grand Wagoneer axle I had. Luckily, Jim Hoeft and Tom Steiger from 4x4 Unlimited love a challenge and agreed to help me with the project. I probably could have done most of the work besides the welding at home in my garage, but it sure was nice to have the aid of experts and the use of a machine shop. We decided to cut the F-150 axle to the same dimensions as the Wagoneer axle so I could use the Wagoneer axle shafts in the F-150 housing. After some careful measurements we decided 2.75" would have to come off each side of the F-150 housing. We would also have to modify the cast-in spring pad to move the spring location .50". This would center the housing between the frame rails and keep it inside the extended flares on my YJ. I wasn't planning on using my Jeep as a daily driver anymore, but I still needed to keep it street legal. 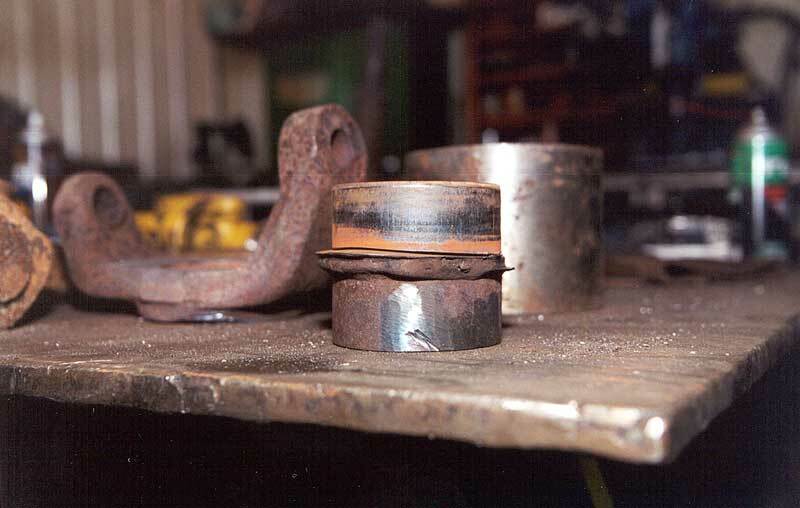 The first step required to narrow the axle was to remove the inner knuckles so they could be reused. Before cutting them off we measured the caster angle of the front knuckles. This measurement is the tipping forward or backward from a line perpendicular to the road surface. 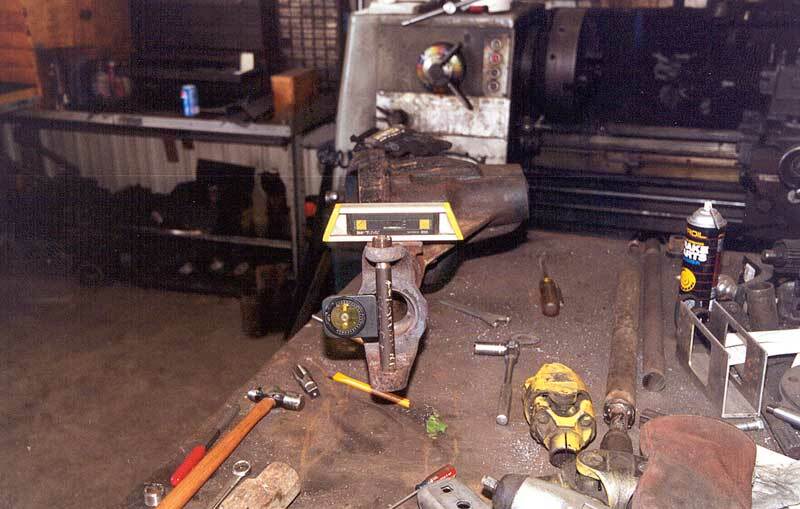 The knuckles should be tipped backwards and this measurement is critical for the vehicle to track straight and for the steering to return to center. We measured this with a digital angle finder and a machined rod mounted through ball-joint holes. The tubes were cut to length using a portable band saw. Since the inner knuckles press on over the axle tubes, these cuts don't have to be perfectly square. Next the inner knuckles needed to be removed from the old axle tubes. I used a die grinder with a cut off wheel to cut through the welds holding the inner knuckle to the axle tube. Separating the axle tubes from the inner knuckles is easiest with a press, but we had some problems keeping the tubes in place so we resorted to the big hammer and block approach. 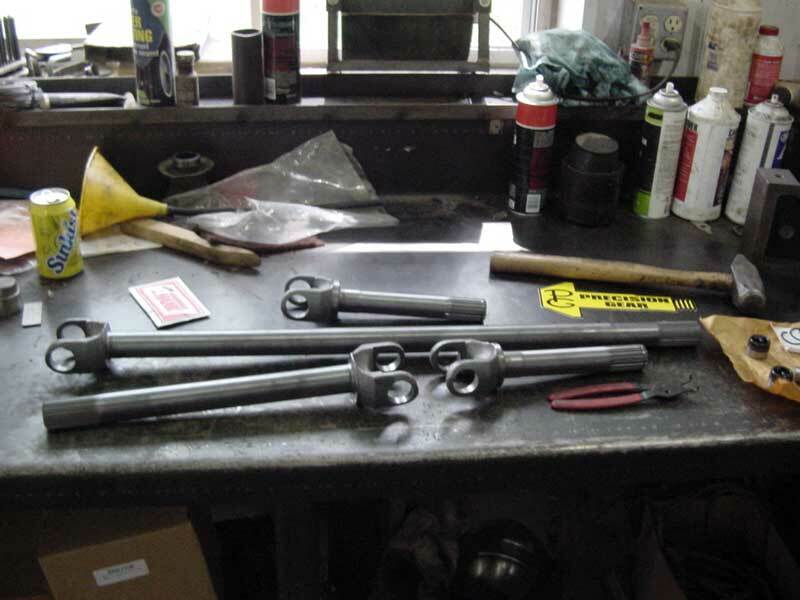 A heavy piece of tubing was used to hold the axle tube and inner knuckle, while a block machined to fit the inside of the axle tube was pounded on to push the axle tube out of the inner knuckle. We then pounded the inner knuckles back onto the shortened axle housing, set the caster angle, and welded the inner knuckles to the axle tubes. The next step was to modify the axle pad cast into the differential. If I was going to buy a custom length axle shaft, I could have left the pad where it was. Since I wanted to be able to use stock length shafts, the pad had to be moved in .5". We found the pad itself was plenty wide to support the new springs. We did have to re-drill the center pin hole and grind a small amount of material out of the webbing on top of the differential so the spring would sit flat. There was also a hole in the webbing for one of the u-bolts to pass through, which had to be re-drilled in its new location. We then ground a notch into the webbing on the bottom of the differential to keep a U-bolt from sliding. Tom welded another spring pad on the other side of the housing and the fabrication was complete. Shock mounts were still needed, but that should be done once the axle is installed. After the housing went back to the paint booth, it was ready to be reassembled. Since my Jeep was going to be used mainly on the trails, I decided to go with a Detroit Locker and a set of Precision Gear 5.13 gears for the new axle. Since my Atlas II transfer case is equipped with a twin stick shiftier, I could shift the front axle in and out of gear eliminating the effect of the Detroit Locker on the steering. I chose the 5.13 gears since they are the lowest available for the reverse-cut Dana 60 I was considering for the rear. All new bearings and seals along with a set of Warn 4340 alloy axle shafts completed the internals of the new axle. The Warn shafts are a lot stronger than the stock shaft, and allow the use of full circle retaining clips on the U-joints. The heat treated yokes are also able to withstand U-joint failures which is one of the failure points on the stock shafts. The housing was now ready to be bolted into my YJ. This was pretty easy because we had lifted the front of the Jeep up to remove the front axle. I put the new Dana 44 on jack stands below the frame and lowered the frame into place. The new spring plates and U-bolts were tightened up and that portion of the swap was complete. Still to come are the brakes and high clearance steering.